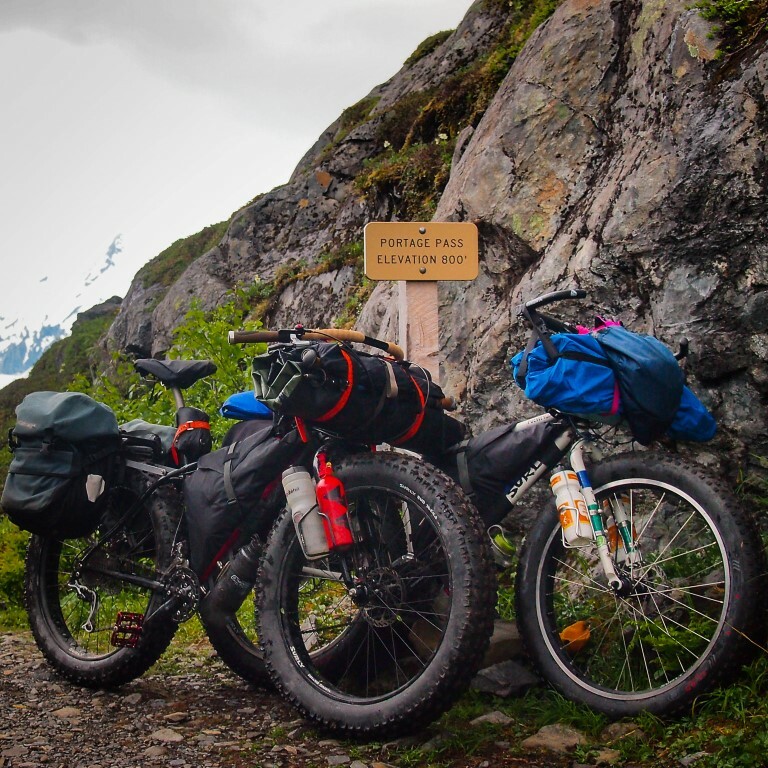 Lisa and I met outside a grocery store in Fernie, British Columbia last year, when I stopped in for a resupply along the Great Divide Mountain Bike Route and she was in town on a mountain bike road trip. As chance meetings sometimes go, within a few hours we were planning a trip together. 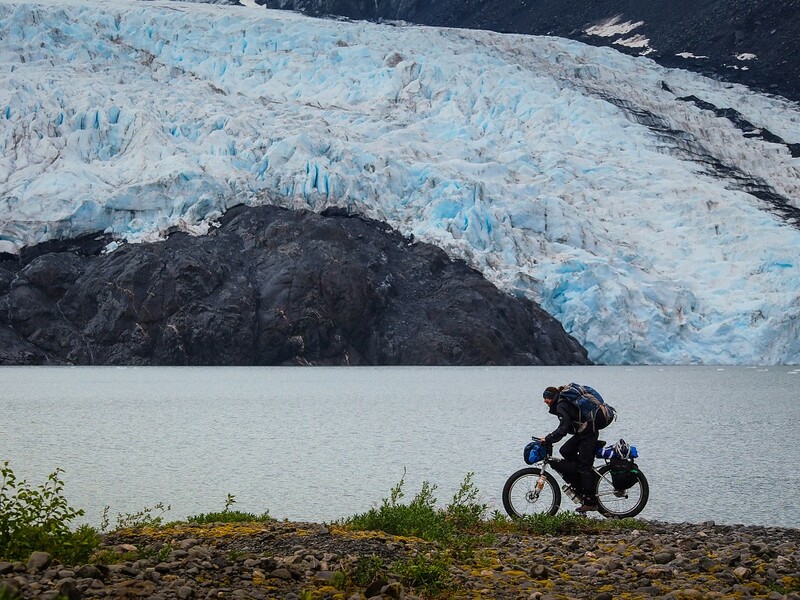 Over the next few weeks, with a few emails back and forth, we settled on bikepacking, backpacking, and packrafting in Alaska for the following summer. 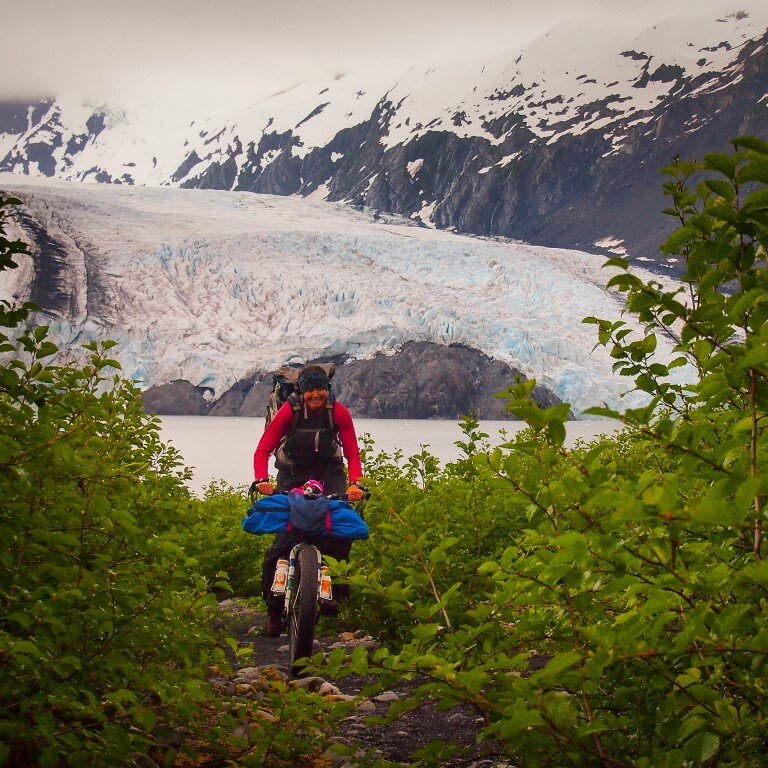 Lisa’s from British Columbia and has spent most of her life living, working, and playing in the Northern BC Mountains. She’s also full of positive energy and game for just about any outdoor adventure. 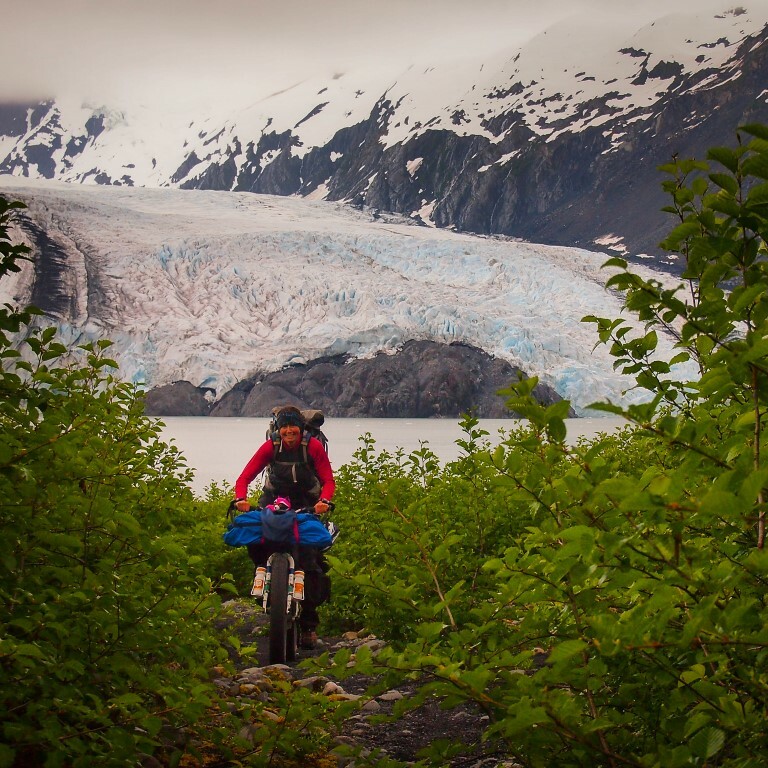 Some may think its a little crazy to head off into the Alaska wilderness with someone you only met once outside a grocery store, but for us it’s how we travel. 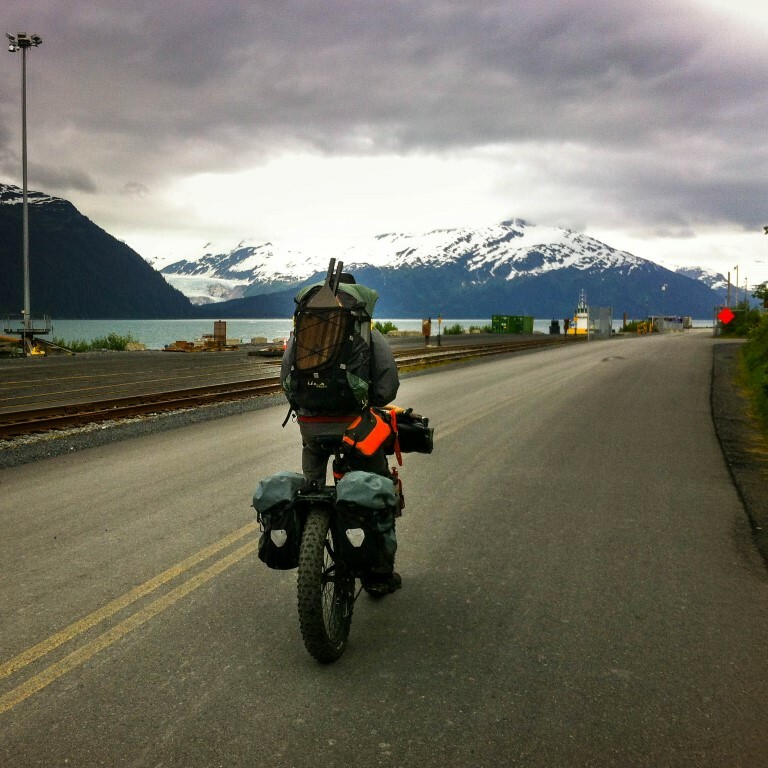 Besides, neither of us knew anyone else with a packraft, fatbike, and months of free time. 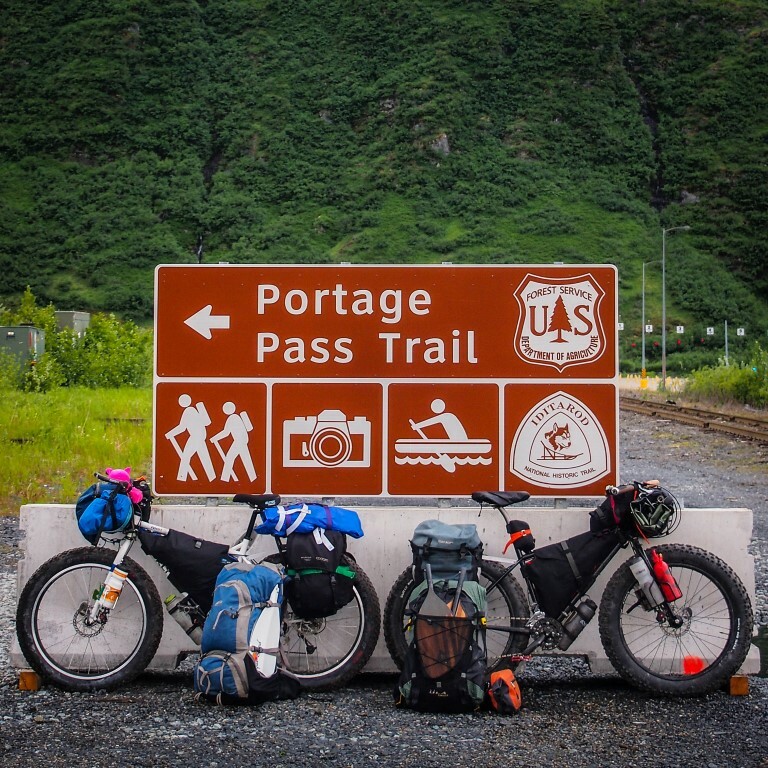 Portage Pass lies at the end of Portage Valley in the Chugach National Forest, about 40 minutes southeast of Anchorage. 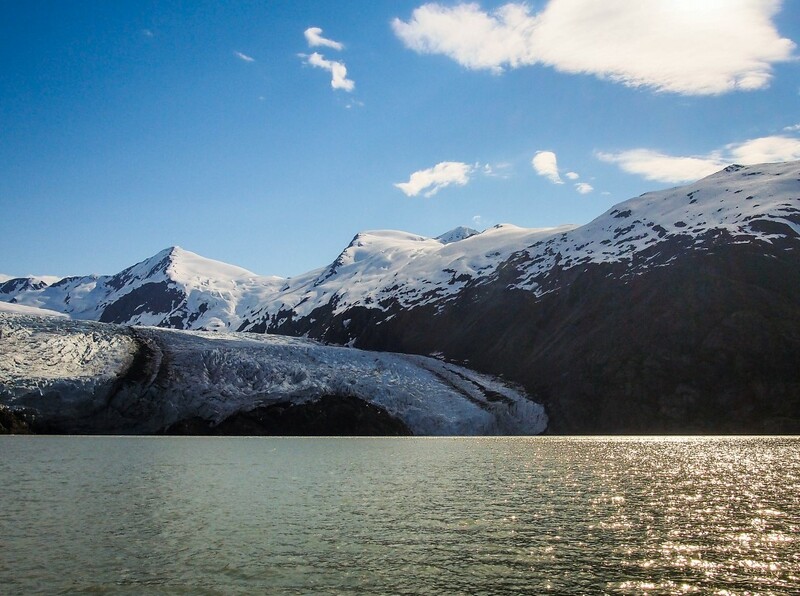 Historically, it was used by Alaska Natives, Russian fur traders and early settlers as a route over the mountains to what is now Prince William Sound. 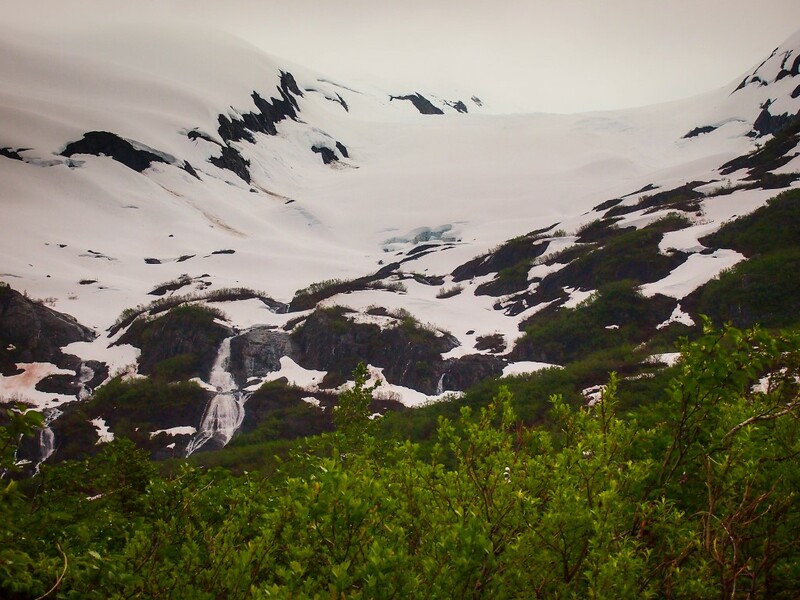 In 1943 the Anton Anderson Memorial Tunnel was constructed, so today it’s a moderate hiking trail from Whittier that ends at Portage Lake, directly across from Portage Glacier. 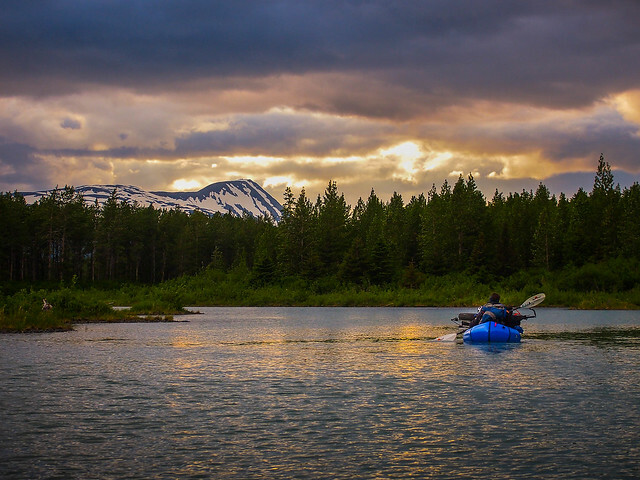 Packrafts, for those who aren’t familiar with them, are inflatable boats that pack to the size of a two person tent and weigh about the same. 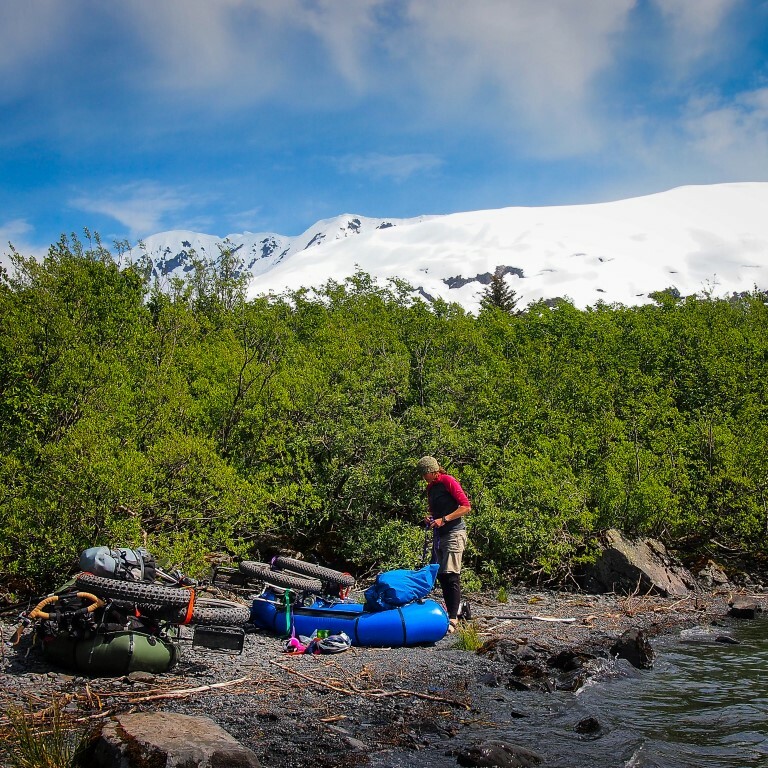 Lisa used an older style Denali Llama with a Cruiser Spray Deck and I used a newer Yukon Yak with a Whitewater Spray Deck. While these rafts are rated to carry around 400 pounds, you’d be hard pressed to paddle them anywhere with that much weight. Also, the larger the surface area above the water, the more wind resistance you feel. Packrafts are remarkably stable when loaded, provided they are blown up firm and the load is secure. Even a little softness can make handling difficult. With warm air and cold water, placing the raft in the water for a few minutes, then topping up the air (a process called tempering) gives the best results. As for strapping down the load, first- quality straps are a must. Besides the risk of loosing gear, a broken strap can make the load unstable and cause the raft to flip. And a full loaded packraft is almost impossible to right without firm ground to stand on. For bike disassembly, I remove both wheels, the non drive side pedal, and the seatpost. 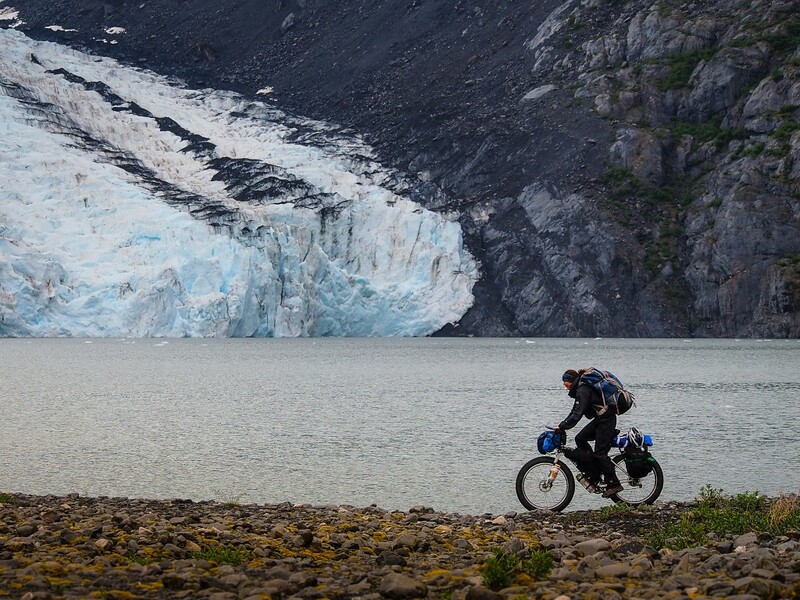 To balance the raft, I put my backpack behind me, strapped to the rear tie-downs, and my bike and bikepacking bags strapped to the front. Steve Doom Fassbinder, who is possibly the father of bikerafting, has a great video showing how this is done. 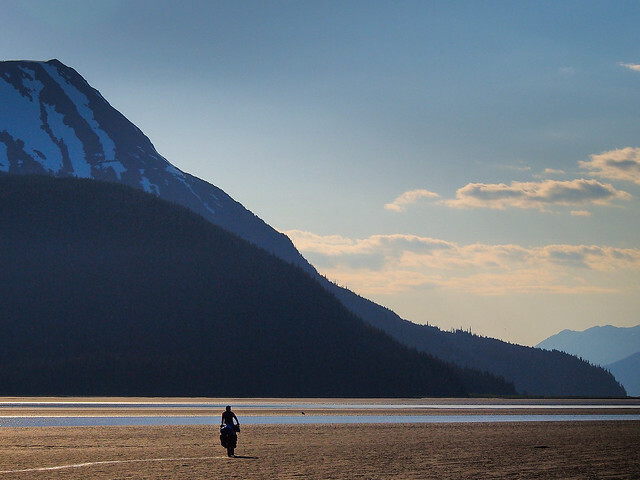 The Turnagain Arm has the highest tides in the U.S. – up to 40 feet, and is known for its impressive bore tide. It’s also known for deadly, quicksand-like mudflats. 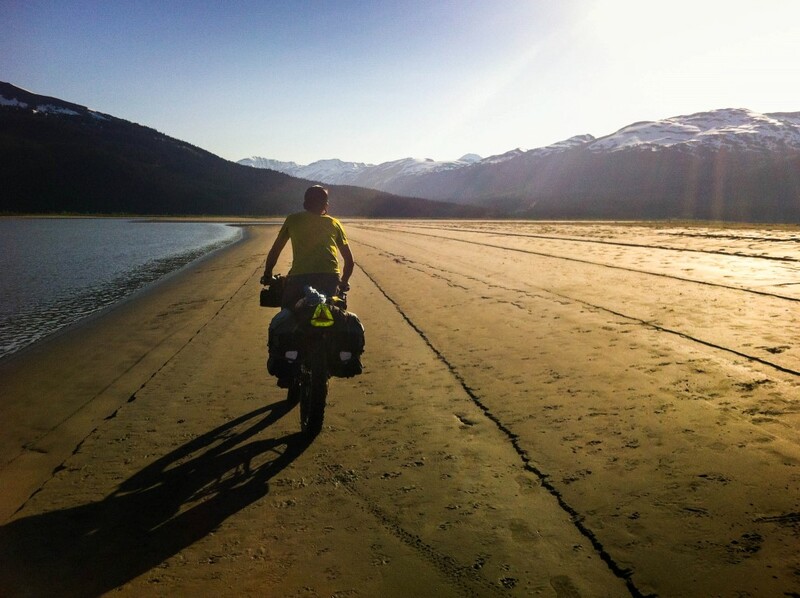 While it’s really tempting to ride out as far as you can see, it’s most definitely a bad idea. 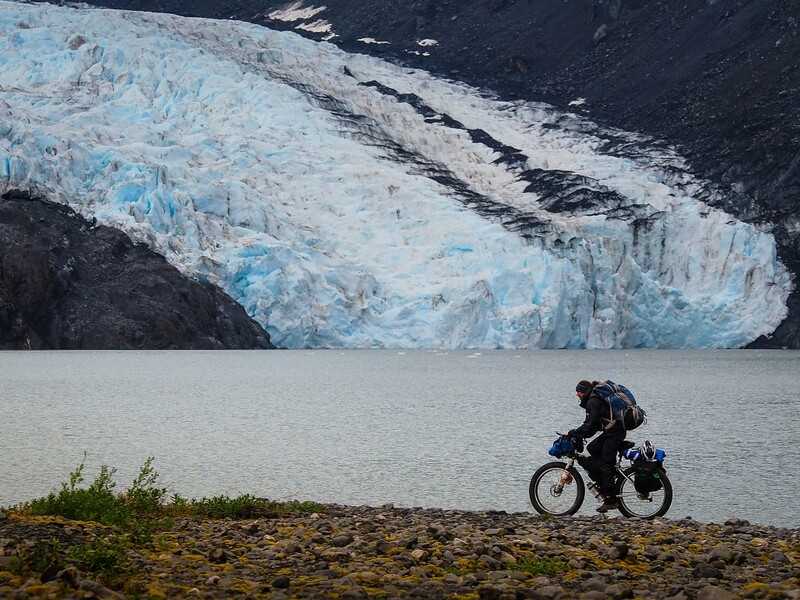 Portage Lake is cold – really cold, and there’s not many places to take out. Falling in is not really an option. 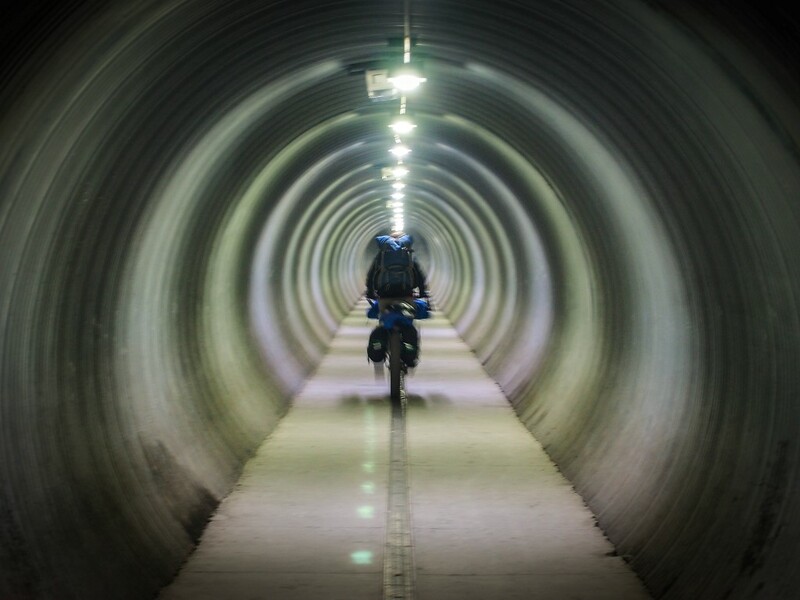 Bikes are not allowed through the Anton Anderson Memorial Tunnel, AKA “The Whittier Tunnel”, but hitchhiking proved to be as easy as we were told. We just asked the first person in line with an empty pickup. Most of the time Portage Creek is easy Class 1 paddling, just be mindful of the sweepers and strainers. 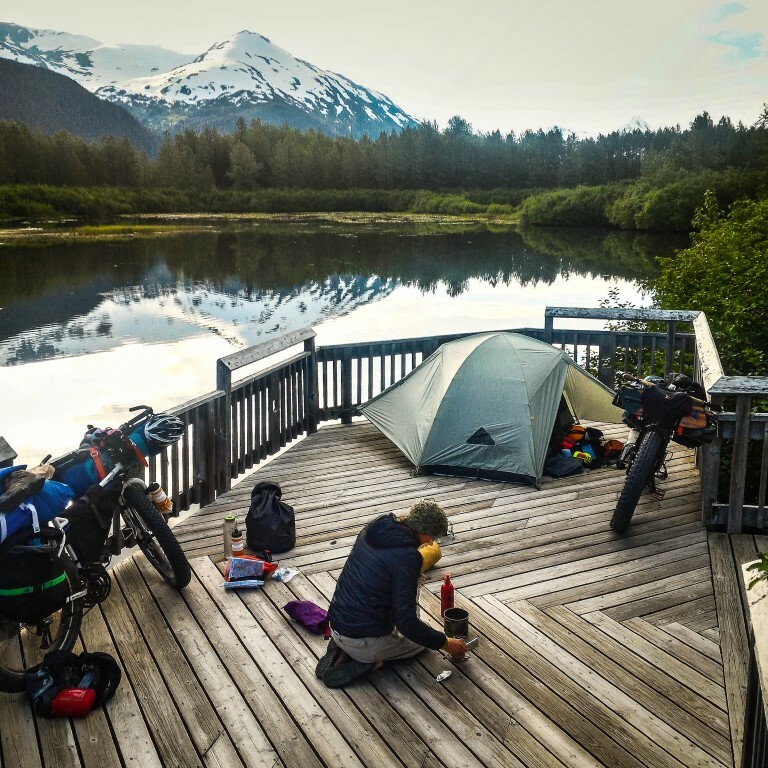 We took out at the boat launch about 4.5 miles downriver, but you can also continue another two miles and take out at the Seward Highway. I’m not saying this is a legal camping spot – but I’m not saying it isn’t. What I am saying is that the trail to here was pretty overgrown and if you found it, I think you’d want to stay here. Loading up the packrafts. There’s a bit of trial and error figuring out a system that holds everything secure and balanced, while allowing a full paddle stroke. Thumbs Up Alaska! 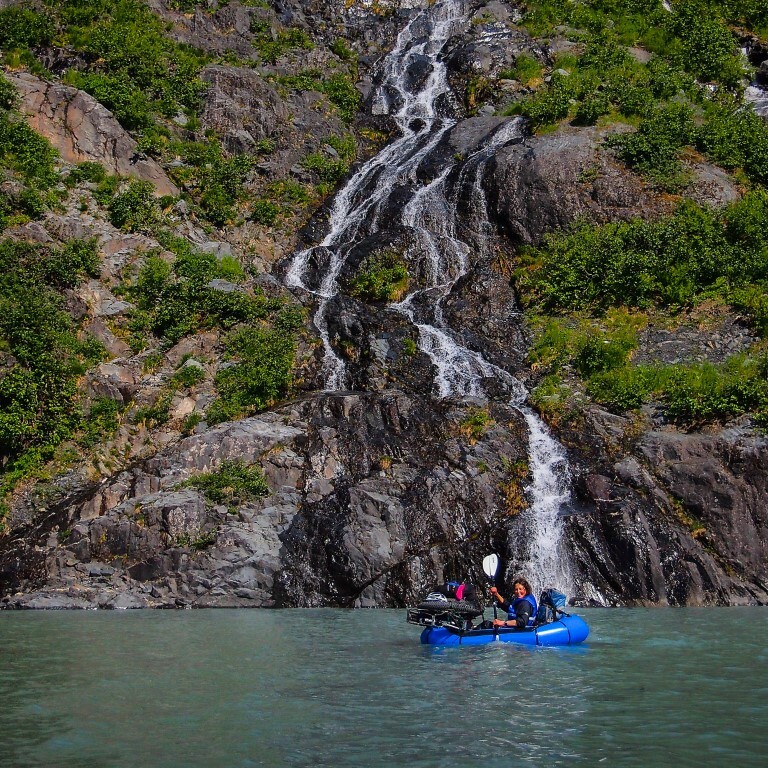 After a few hours of paddling into a headwind, we arrived at the Portage Pass Trail. At this point we wished we weren’t carrying six days of food on an overnight trip. After hitchhiking through the Whittier Tunnel, we blew up the packrafts again for a float down Portage Creek. 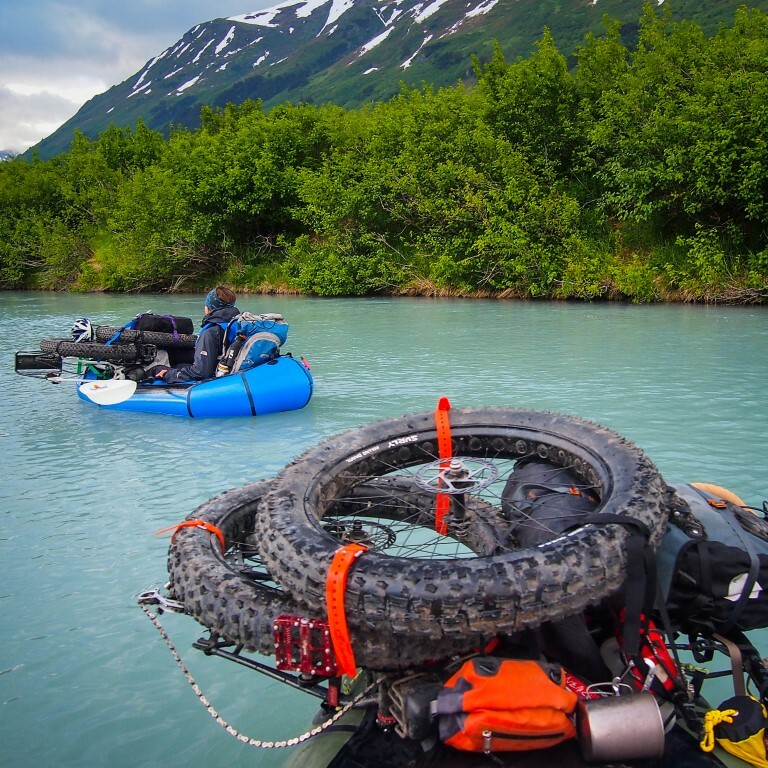 A couple of hours of floating took us to the boat launch, where we packed up the rafts, assembled the bikes, and headed to another great camping spot. 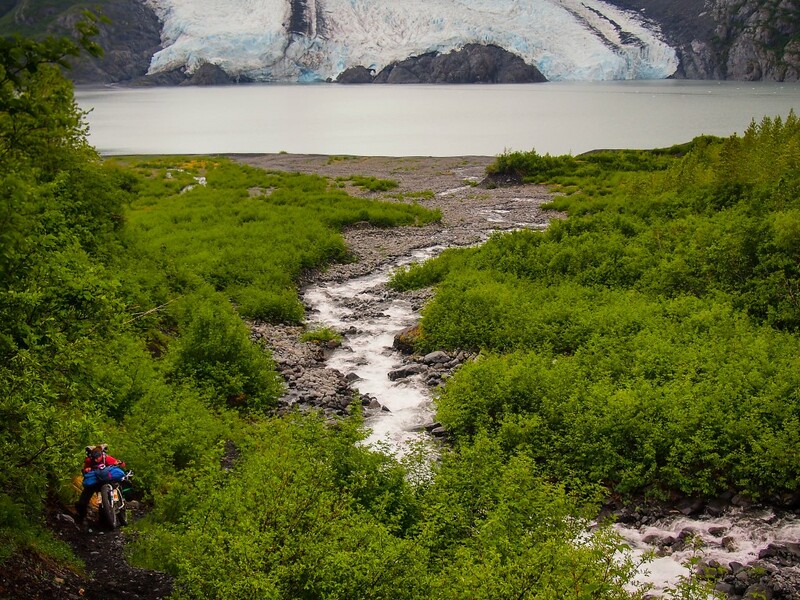 Thanks for visiting and stay tuned; this was just the beginning of our Kenai Peninsula trip, so there’s more to come. Awesome post and pics! May have cost me though…I really want a packraft now!!! Thanks! 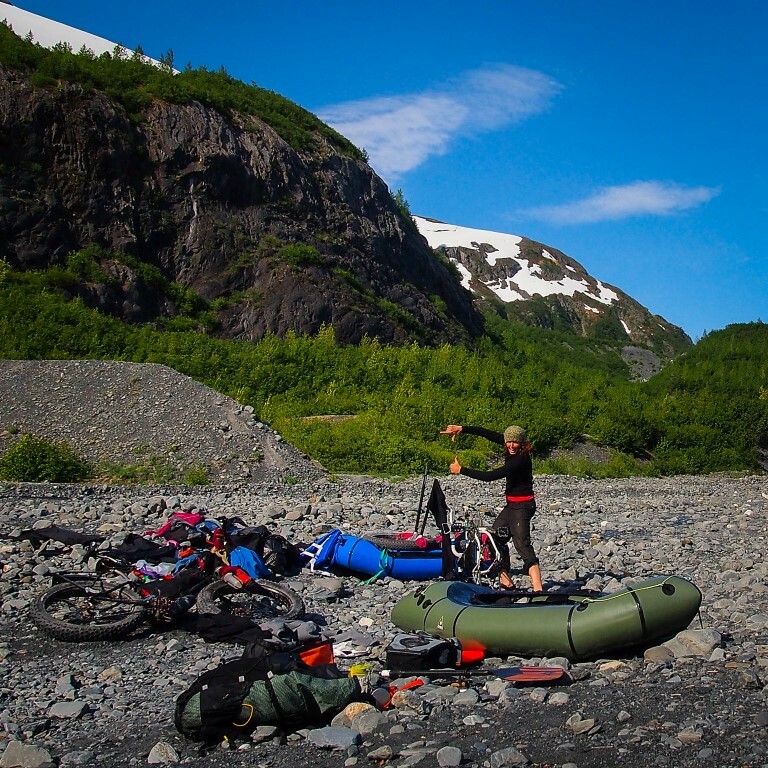 Depending on where you’re traveling, a packraft may be a great addition to your kit. Beautiful trip man, I am really jealous! Sounds like a hoot. I’m surprised you found a walking tunnel through to Whittier. 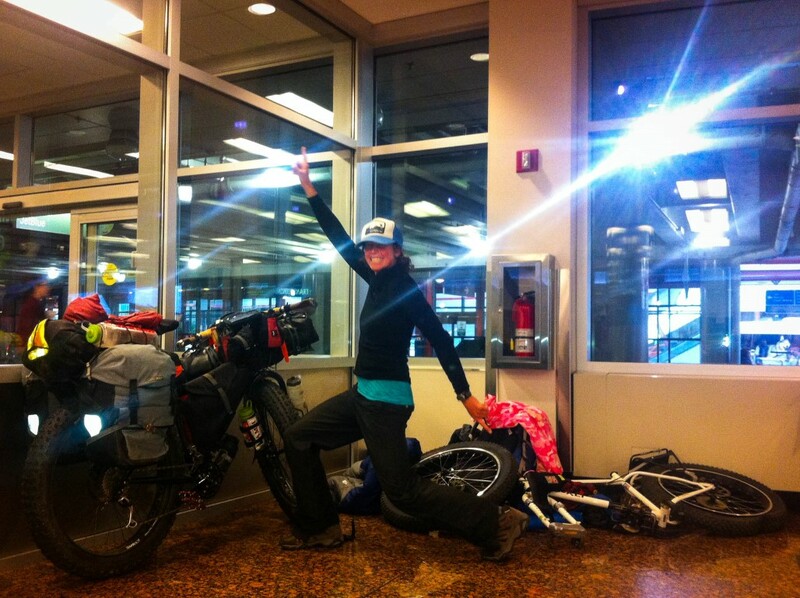 When I took the ferry up from Bellingham to start my ride South I had to hitch through the tunnel… cool! Hey Scott! The walking tunnel goes between the marina and “downtown” in Whittier, not through the mountains. 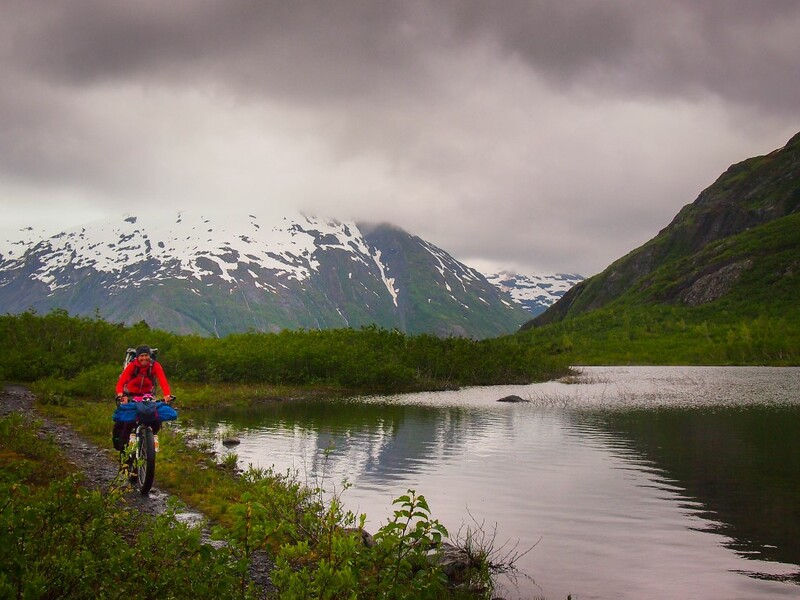 Part three of your trip along the Trans-Ecuador MTB Route looked pretty epic; I hope your ankles have healed up. Oh man that looks like a great trip! 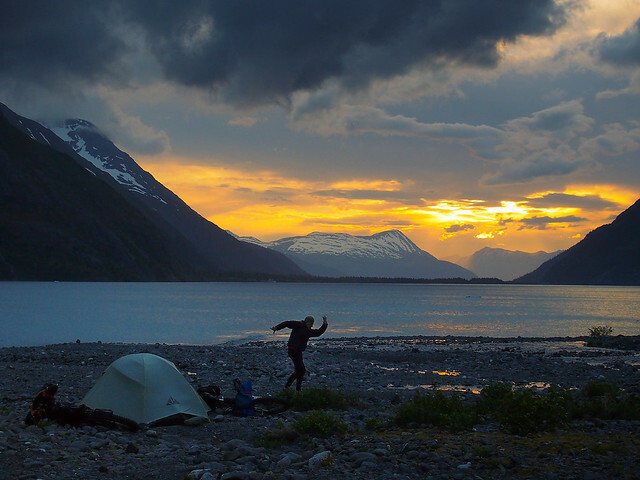 Great pics, and I think that camping spot looks totally legit. Any fear of bears? I’d be a bit nervous zipping down a trail like the “and then we descend!” pic. 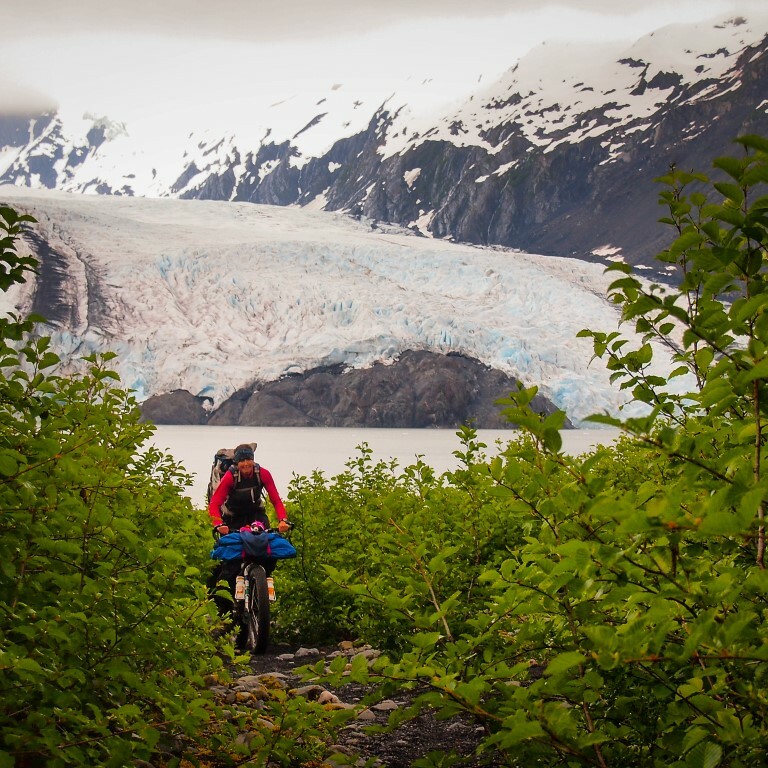 We only have tiny black bears in our area but I would love to go on a similar adventure in Alaska! Thanks Dave! 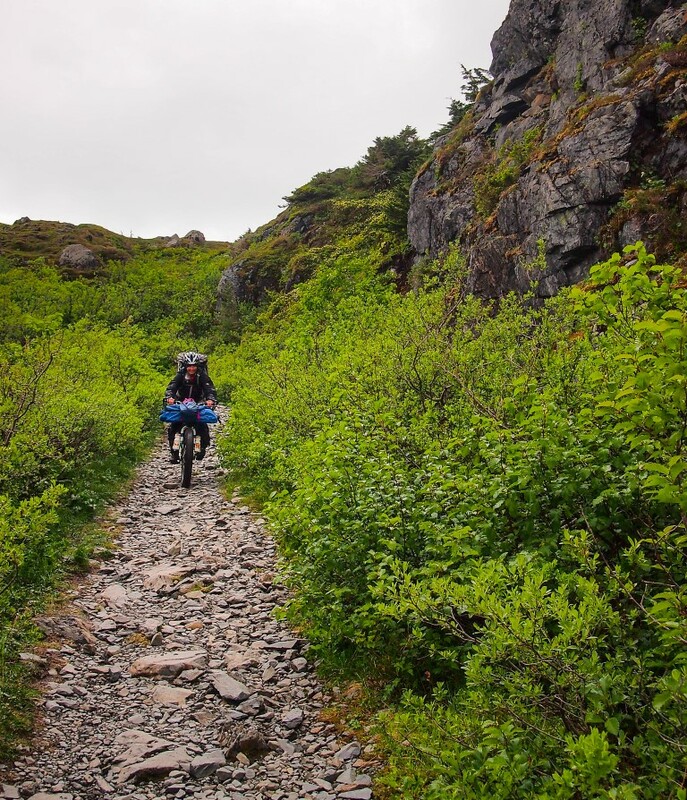 We rode a lot of beary singletrack, but didn’t have any problems. I usually clip my titanium mug with a carabiner to one of my bags as a noise maker; it sounds like a cowbell. We also hooted and hollered when the brush got thick. Really, with proper precautions, negative bear encounters are pretty rare.